You'll be £14.99 closer to your next £10.00 credit when you purchase Veteran Lancs. What's this? Aviation historians will know that the Avro Lancaster bomber is the most famous aircraft to have fought with RAF Bomber Command during World War Two. They will know too that, of the 7,366 that were built, over 3,400 were lost on operations and a further 200 plus were destroyed and written-off in crashes. Operational sorties flown totalled more than 156,000, carrying over 600,000 tons of bombs to targets all over Europe. But this came at a terrible cost. With extensive losses on some night operations, occurring when bombers were pitted against a dedicated German night-fighter arm (as well as anti-aircraft fire) it is not surprising, or even incredible, that just 35 Lancasters managed to complete 100 or more sorties during the course of the war. A number of them actually achieved well over one hundred sorties, and a few were tragically lost after reaching this amazing figure. 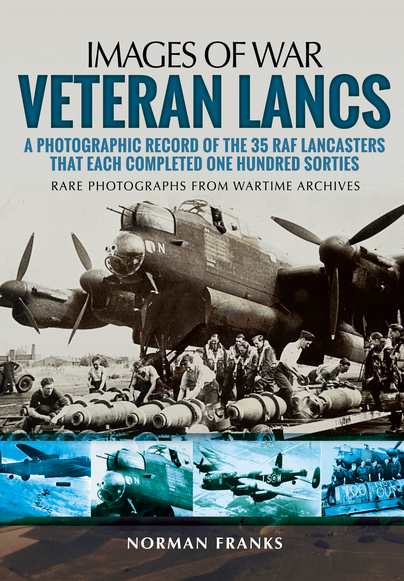 This book covers the history of these 35 incredible Lancasters, featuring many photographs of both aircraft and crew members drawn together in an effort to create a photographic record of these veterans. In addition, there is a section dedicated to many Lancasters that, whilst not achieving this almost magic total, either through eventual loss or the ending of the war, did achieve a large number of operations. Pictures of these have been added so that their achievements, as well as the achievements of the crews who flew in them, can be viewed together. about twenty trips before being lost. It’s therefore no surprise to learn that out of more than 7000 examples, just 35 are known to have flown more than 100 raids. wasn’t quite enough recorded detail to work with. draws extensively from a very large collection of images that have never before been published.There are some outstanding photos among them. prints, it may well be that this is as good as it gets. Because of its subject, this volume is encyclopedic in nature. It is well written, and contains a wealth of information about its subjects. This recent Images of War title takes an interesting look at the famous Lancaster. As it tells us in the introduction, I think it is quite thought provoking that of 7,366 Lancasters that were built, only 35 made it to the magic figure of 100 missions. To reach this figure took longer than you might have thought, but it also gives a good indication of the loss rates suffered by Bomber Command, and the odds that were against the 7-man aircrews who manned each Lancaster. It is an interesting story and great to have a collective record of these 35 aircraft and the crews who flew them. For the modeller, you will also find some useful reference detail for the aircraft themselves, as well as uniforms and ground equipment that was used around the aircraft.